IEC 80601-2-30:2009 applies to the basic safety and essential performance of automated sphygmomanometers, which by means of an inflatable cuff are used for intermittent indirect measurement of the blood pressure without arterial puncture. It covers electrically-powered intermittent, indirect measurement of the blood pressure without arterial puncture, me equipment with automatic methods for estimating blood pressure, including blood pressure monitors for the home healthcare environment. 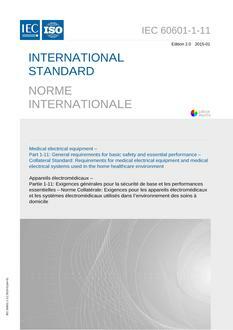 This first edition of IEC 80601-2-30 cancels and replaces the second edition of IEC 60601-2-30, published in 1999. 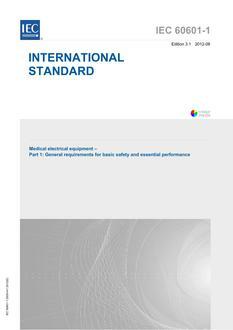 This edition constitutes a major technical revision as well as an alignment with the third edition of IEC 60601-1. Specific technical changes include: expansion of the scope to include all automated sphygmomanometers including those where the patient is the operator, identification of essential performance, new clinical accuracy requirements, additional mechanical strength requirements and prohibition of operator accessible 'Luer' connectors in the pneumatic system.